Manual Scan feature lists all activities, services and receivers associated with an application - in this case the android core system. 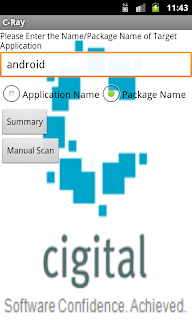 Click the "android.accounts.GrantCredentialsPermission" from the manual scan list and continue with default action. CLick "Yes". The system will freeze for a moment and then reboot with your usual boot screen image/logo. An input validation error was uncovered in the "android.accounts.GrantCredentialsPermissionActivity" activity of android system. The "android.accounts.GrantCredentialsPermissionActivity" activity is an unprotected public component of the android system and can be initiated by sending an intent with appropriate input data (a.k.a intent extras). However it was observed that the "android.accounts.GrantCredentialsPermissionActivity" does not validate incoming intents to check if the intent has extras. This forces the system to reboot. A malicious app can incorporate this vulnerability along with an SMSReceiver and BootReceiver Broadcast receivers to trigger a system reboot and force the system to keep rebooting. I was able to write a POC app which starts the reboot cycle upon receipt of an sms and force the system to reboot continuously, every time it comes back up. The time duration between reboots is quite small (depending on device used) and does not allow the user to uninstall the application from settings. On a production device with stock/non-rooted build the only way to stop the reboot process would ideally be restoring the device to factory settings and wiping data partition. This issue was reported first in Android core system running on 2.3.4. Google had responded immediately and informed me that they have fixed the issue. At the time of writing this blog,the issue was still at large even on Nexus S running 2.3.6 & 2.3.7. The real question is: How long before this issue will be fixed on multiple fragmented releases by multiple vendors.